It’s not often that volunteering gets a bad rap. Everyone praises and pushes volunteering - volunteering as a means to assisting your community, volunteering as a tool for learning, volunteering as a way to expose yourself to new experiences and cultures. Even President Obama is calling on Americans to volunteer in order to help our country out of the current recession. But what happens when volunteering just isn’t enough? Imagine that you’ve volunteered, volunteered and volunteered for “Cause X” (insert a cause close to your heart here). And after all the time you put in, you don’t see any progress. Where do you go? What are your next steps? Are you likely to volunteer again? Many individuals arrive at this critical intersection, one in which I think we often lose people to discouragement or boredom. This situation also represents an opportunity, a place where volunteering can develop into advocacy. Here's one of my personal favorite examples of the volunteering to advocacy transformation. The Youth Council, run entirely by its members, has two goals: to better their community and to show the adults that they too can make a difference. The group started out with small projects, activities that could be done in a day with tangible results (very much in line with the Small Wins Theory). Their first project was cleaning the local park. And did they ever clean it. That first day they spent over six hours in the park picking up trash. It was a good day, and for many, marked their first involvement in a volunteer project. 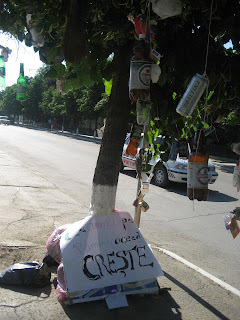 Over the next few days they showed off their handiwork in the park (a popular meeting place for members of the town, also the site of the local “piata” or market). This pride was short lived, as less than a week later, the park could be described as “dirty.” So again, the youth decided to meet and clean the park. Their second effort took less time, but they also had less enthusiasm for doing a job they had already done. Another week goes by, and predictably, the same thing. Again the youth clean it. (It’s gotten to the point where people in the town have actually commented that they think the youth are being paid to clean the park). Eventually the proposal to “clean the park” was met with strong resistance within the Youth Council. “Why clean it, when it’s just going to get dirty again? !” Giving up on it was discussed, as were other options, which got to the root of why people were littering in the park in the first place (laziness, lack of trash cans, lack of knowledge of the effects of pollution, thinking “it’s just one piece”). Installing trash cans was a possible solution, however, the youth didn’t have access to funding. The conversation moved towards how we could get people to stop littering. As we know, changing behaviors involves changing attitudes, and advocacy is one tool that can be used to influence others’ attitudes. Advocacy was a new idea to the youth council members. I presented what I knew about it - getting people’s attention, raising awareness, and lobbying for change. To them, at first, the idea sounded similar to “do nothing” especially because there weren’t guaranteed concrete results. They struggled with whether the activity would be worth their time, how they would gage success, and the reaction of the population (they wanted to err on the side of not upsetting others). The group came up with a creative, idea - very specific to the beliefs and values of their community. The next Saturday we gathered and cleaned the park, one last time. Instead of throwing out the trash, we stored it. 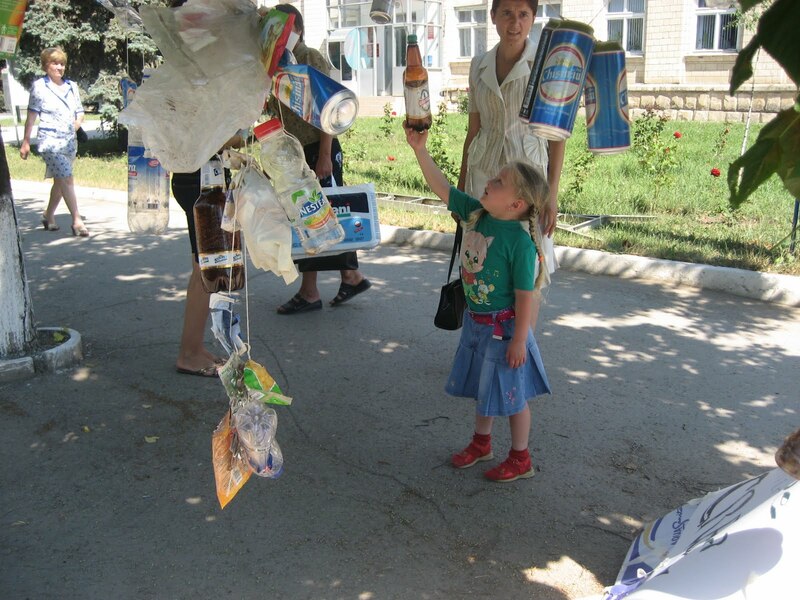 In the morning, the youth tied strings to each piece of trash - from candy wrappers to empty beer bottle, and moved the trash into the center of town. 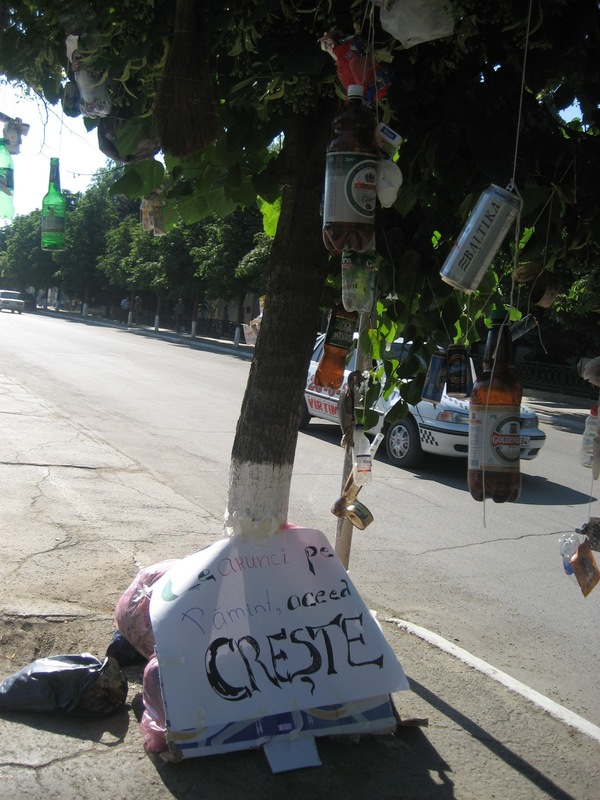 They then tied the trash to the branches of a tree - it looked as if the tree was “growing” trash. Underneath they wrote in Romanian, “What you put in the ground, that, is what will grow.” This message was highly appropriate for the agriculture-reliant population. They then stepped back to observe people’s reactions to the tree (Sunday is market day, so the tree got a lot of traffic). Many simply walked by the tree, confused. Others yelled at the youth for putting the garbage where it shouldn’t be. Many more stopped to talk. “What are you doing?” “Where’d you get this trash?” “Is it Christmas?” “Do you really think this is true?” “Who are you?” etc. It was a great chance for them to talk about the Youth Council and their ideas for putting trash cans in the park. 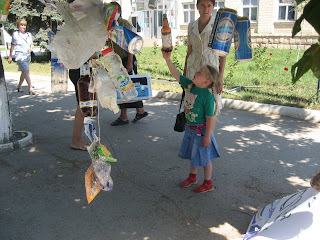 People were amazed at the amount of trash that accumulated over such a small time. The “buzz” generated by the “strange tree” the youth made lasted a few weeks. At the time they weren’t able to capitalize on the buzz and secure funding from the local public authorities for trash services in the park. But the activity did get them recognized, gave them credibility in the town, and generated excitement about the environment. As a council, they started to attend the meetings of the local government. The next time they cleaned the park, others joined in. They kept this up for six months until something was done. Currently, there are eight trash cans through the half mile park at the center of town, and according to the youth, they don’t have to clean it more than once a year. A success in their eyes! The group described in this piece was the "Counsilul Local al Tinerilor in Singerei"
This blog entry was part of an upcoming “Community Stories” series. Do you have a story from your own community work that you would like to share on our blog? ... a teachable moment? ... lessons learned? ... insights into a community? ... funny incidents? ... collaborations or achievements you are proud of? Please share your stories with us - and with the larger community. What a creative idea! It's great to see what kids who aren't familiar with expectations of what activism should look like (protests, flyers) come up with. Really ingenious.